Apologies .. I'm about to rant! Yes, I know that Monday Smiles is supposed to be lots of nice little things that have happened in the past week to make us all smile and realise that life is actually pretty awesome but sometimes a rant is good for the soul no? Ever since we returned from holiday we've been having major issues with our washing machine (I didn't promise it would be an interesting rant did I?). The clothes, especially towels and thick jumpers, have started to really pong when they're drying. I've spent a lot of the week trying lots of different ways to dry our laundry but I think we now have to admit it's a fault with the machine. It is so frustrating, especially with the cooler weather arriving, I'll be very upset if I don't get to wear my new Autumn wardrobe because it's all stuck in the laundry bin. It feels like Autumn has truly arrived this week and I had some very enjoyable shopping trips when pay day arrived on Friday, however I am now banned from any more clothes purchasing until next pay day as I feel I may have overdone it (especially in New Look). The cooler weather has meant that some of my new boots have finally got their debut outings and yesterday I wore my beautiful new suede ankle boots. I may have been slightly hobbling by the end of the day but they looked fantastic. The weather has pretty much been warm and sunny ever since I arrived in Newcastle so I'm now really looking forward to experiencing the cooler weather in my new home. The sudden drop in temperature has however left me a bit stumped on how to spend my lunch hours during the week. Suddenly sitting on the Quayside with a trashy magazine isn't going to work. I've made the decision to start going on a bit more of an explore at lunchtimes to try and find the perfect place for me to hide away in the Winter months the main criteria being comfy seats, nice atmosphere and good coffee. 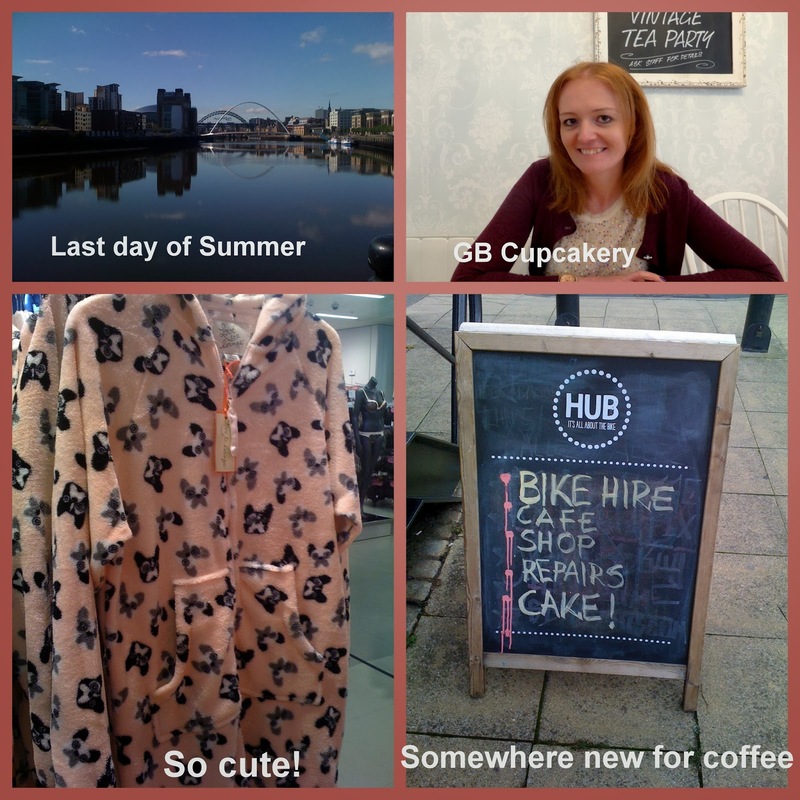 I've started my mission with my first visit to The Hub, a lovely little space that gives the cyclists of Newcastle somewhere to meet whilst enjoying some coffee and cake. It's a definite contender for my Winter hideaway place. If anyone has any other suggestions of good warm places to hide near the Quayside please do let me know! We've enjoyed a quiet weekend at home this week and on Saturday finally visited the GB Cupcakery for afternoon tea, there's a little sneaky peak photo below but look out for a proper post of our experience later in the week. ... and I leave you with my final thought ... onsies! I've never ever joined the craze and never thought I'd want one, until this cute doggy one appeared in Primark. I kind of want it! Ooooooooooh may have to go have a look! I have two now and loving them so much, keep me nice and snug.